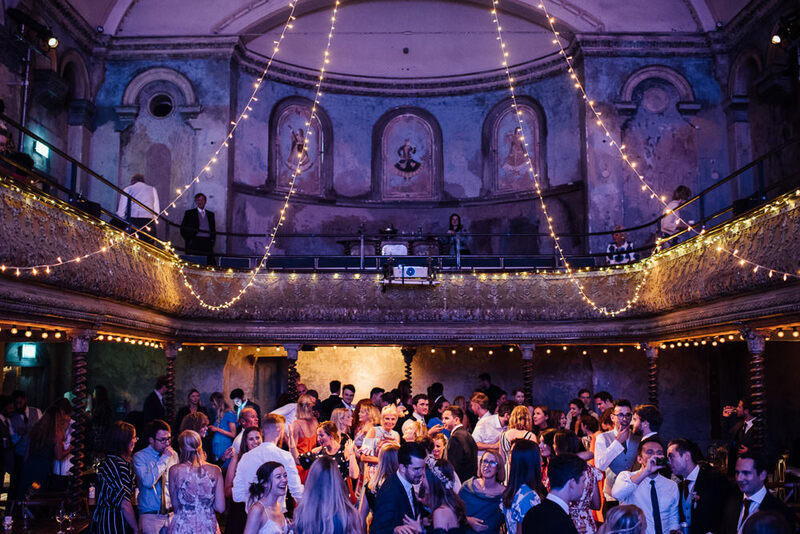 We are headed to two of London’s most amazing wedding venues today for WWW readers Jack and Jenine’s celebrations. 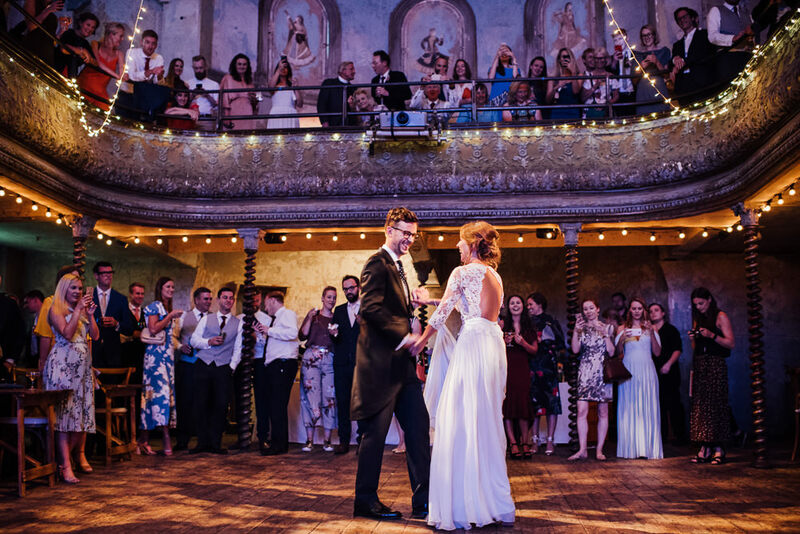 Our pair were married at St Paul’s Cathedral before hosting their reception at the magical Wilton’s Music Hall on the 11th August 2018. 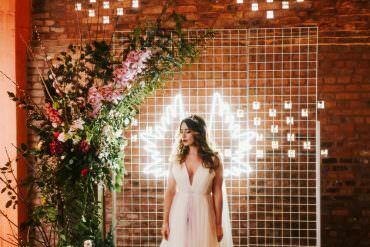 A spectacular celebration surrounded by their nearest and dearest was the vision and it certainly exceeded that and more by the looks of it. 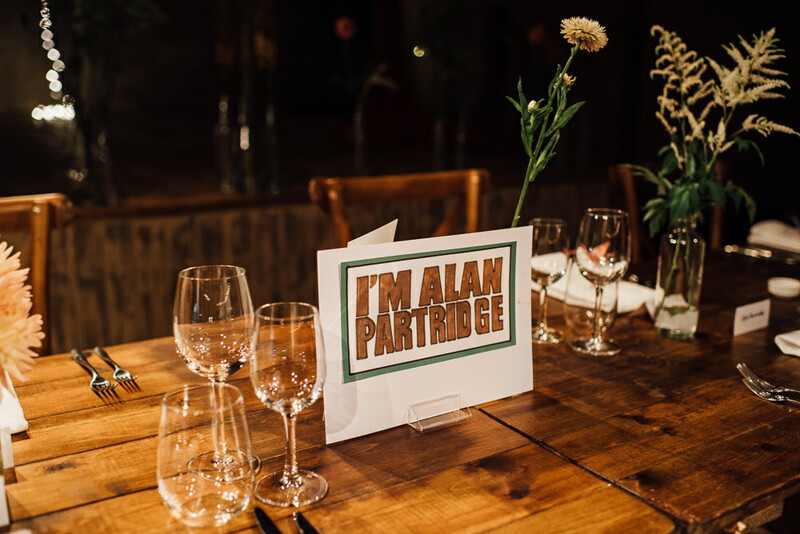 Guests were treated to sublime cuisine, live music and sensational atmosphere. 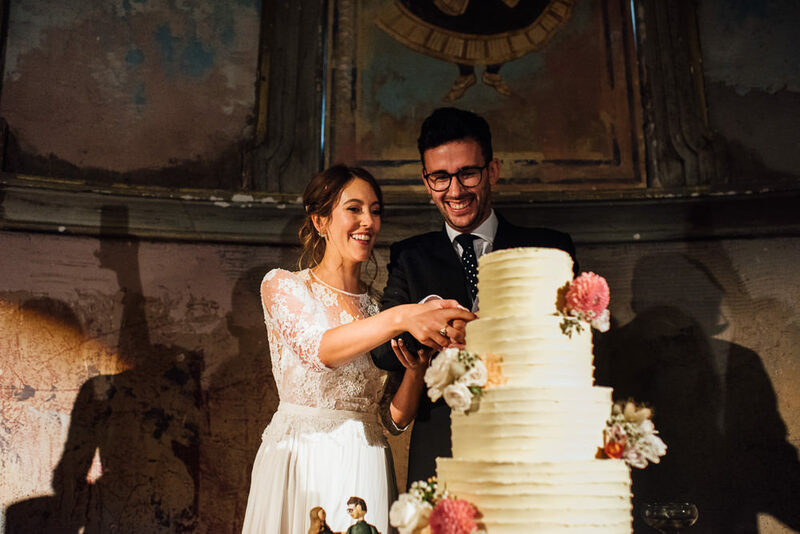 There is so much to love about their wedding, from the stylish attire to the whimsical florals and the buttercream cake creation, not to mention the fairy light adorned reception hall. Wow. 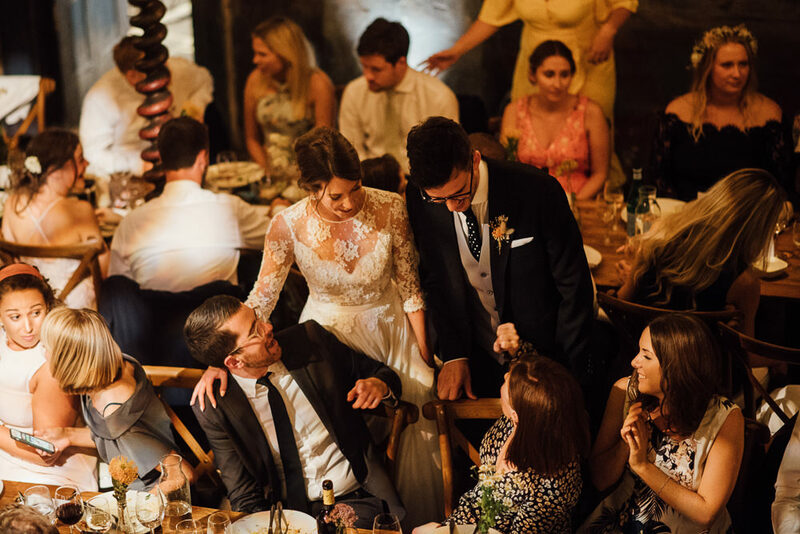 The Shannons have really captured all of the moments so beautifully and we are super thankful to be sharing these outstanding images with you. 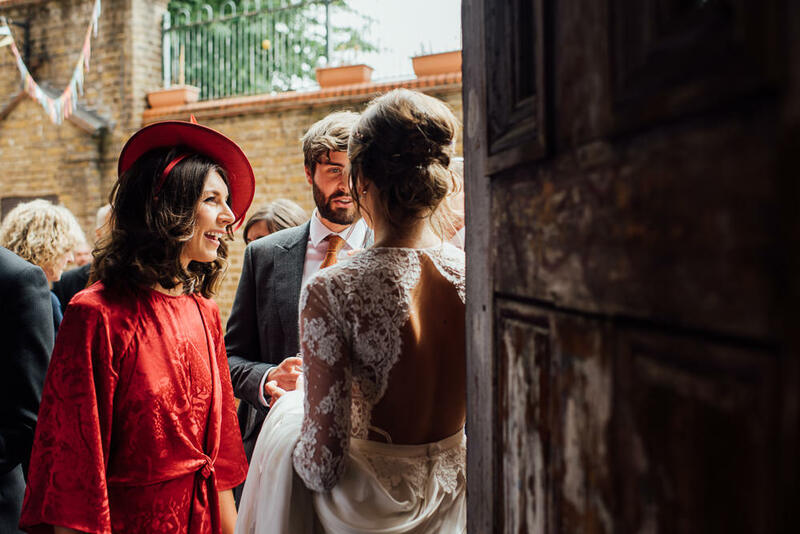 You really can feel the happiness, love and warmth radiating all day long. I also have a feeling fellow romantics are going to adore the proposal story as much as I did. I enlisted the help of two of Jen’s colleagues and best friends, Lucie and Jess, for what would be a big undertaking. The proposal would happen on a Friday, during working hours to maximise the surprise. We devised a plan which would see Jen thinking she was going to a meeting with Sutton Council to discuss the plans for Crossrail 2. 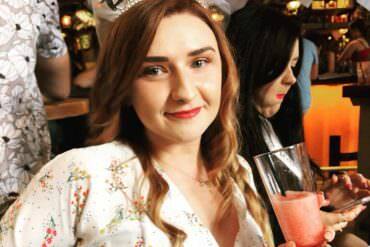 I organised train tickets and taxis, whilst the girls looked after keeping the ‘meeting’ believable. When Jen arrived at Painshill, she was met by one of the park’s staff, Olivia, who pretended to act as the councillor’s PA. She even dressed into a suit for it! 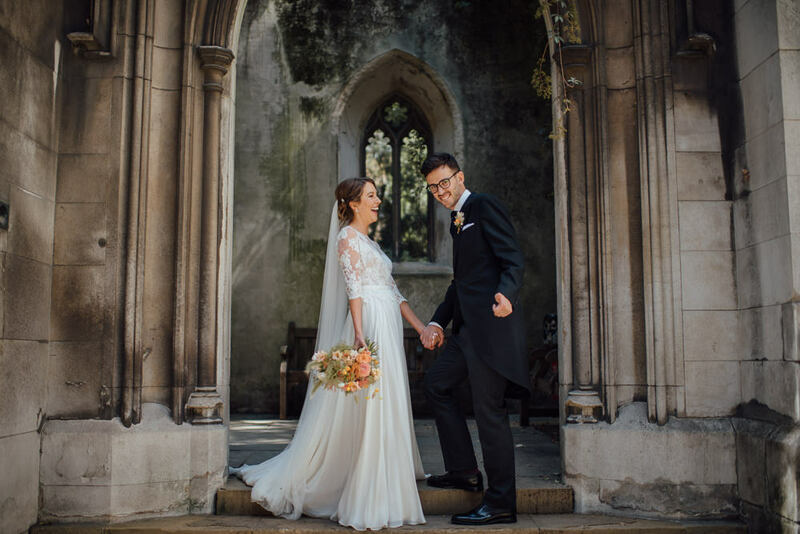 I imagine there was some confusion when the three of them were put into a golf buggy (luckily, she is really gullible) and driven up a steep hill passing stunning bridges and a delicately dilapidated abbey as the sun was starting to set. The weather was perfect, it was a brisk winter’s day but the trees and leaves still maintained their autumnal colours – but most importantly, the rain held. 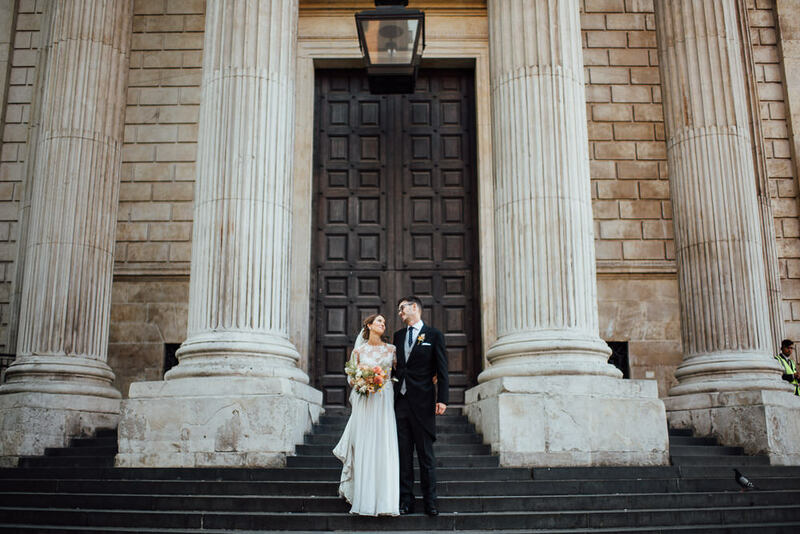 When she got to the top of the hill, she was told ‘the meeting’s just for you’, and I waited in my suit by the Gothic Temple which had been surrounded in candles. 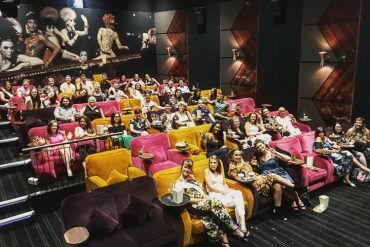 We tend to not be a particularly ‘showy’ or outwardly romantic couple, but we knew we wanted a place big enough for all of our families and friends to be together in one room and to have a great and spectacular celebration! 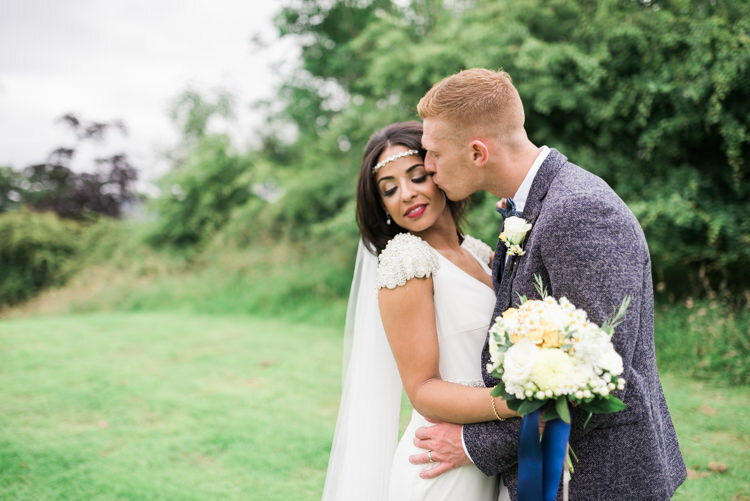 Jenine: As we’d met in London and both families had moved from our childhood homes, we knew we wanted to get married in the city. We didn’t want to have to rely on good weather, and we both love the autumn (Jack really can’t deal with heat) so that was the plan. 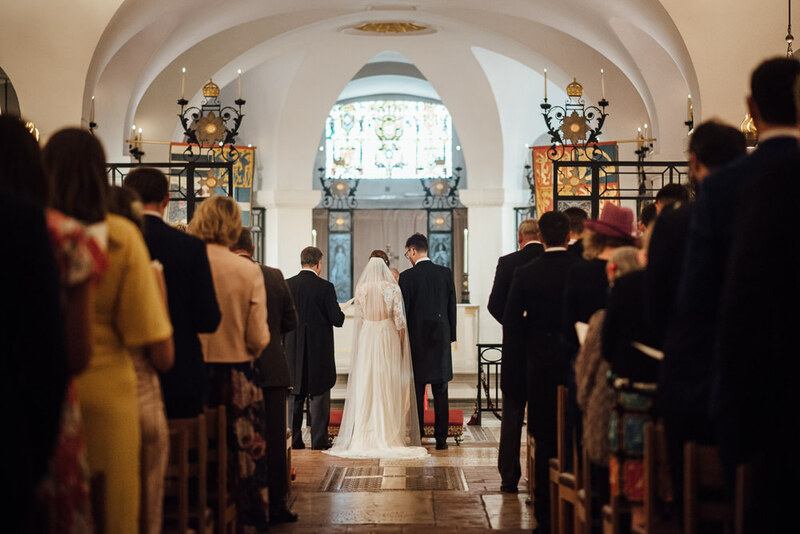 As Jack was christened in St Paul’s due to his dad having an OBE and as I’m an architectural historian, we both loved the idea of getting married in the Cathedral. 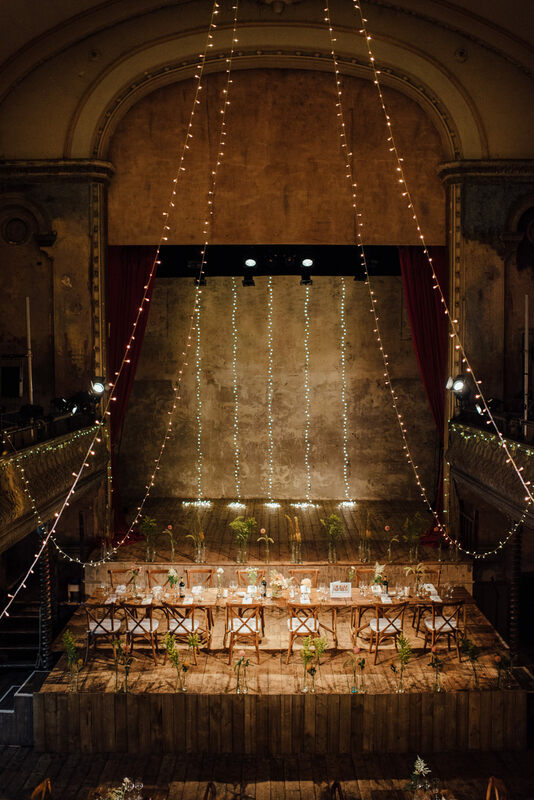 Pre-engagement, the only time I had ever properly brought up wedding venues (we’d always just talked around the idea by discussing our plans for who would be best men and bridesmaids) was when we went to Wilton’s Music Hall – the oldest surviving Victorian music hall in the world – and I remarked that it would be an amazing place to get married. 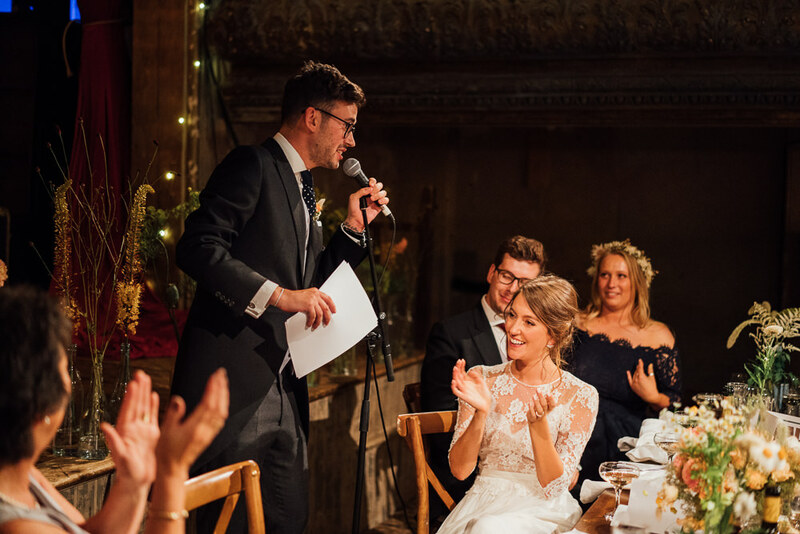 Luckily Jack was similarly impressed, so when the time came we knew what our perfect wedding would be – a ceremony at St Paul’s followed by a reception at Wilton’s Music Hall. 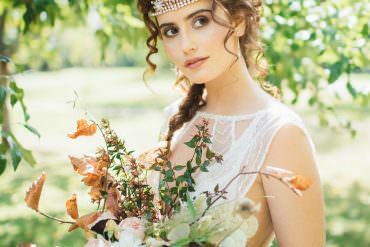 Whilst we knew where our dream wedding would be, securing dates proved to be just as tricky as we thought. 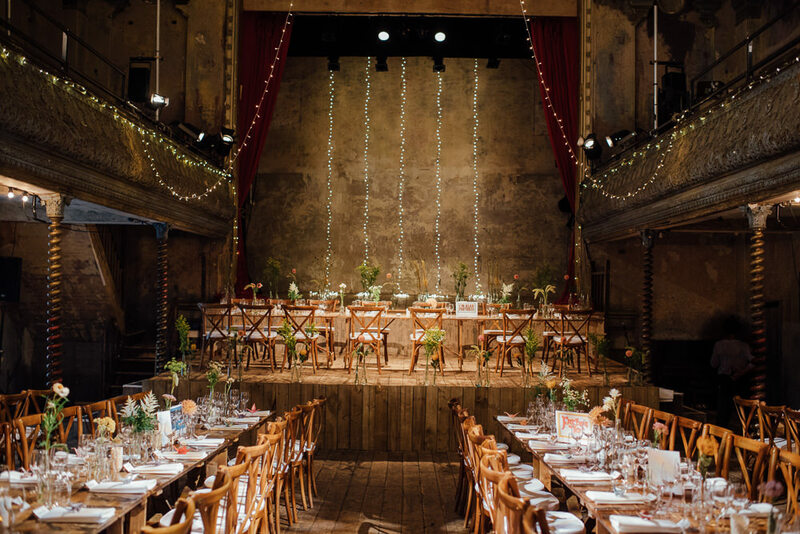 Wilton’s Music Hall tends to only be available for weddings for a few weeks each summer – which put paid to the idea of an autumn wedding – and St Paul’s tends to be booked up far in advance, especially for summer weddings. 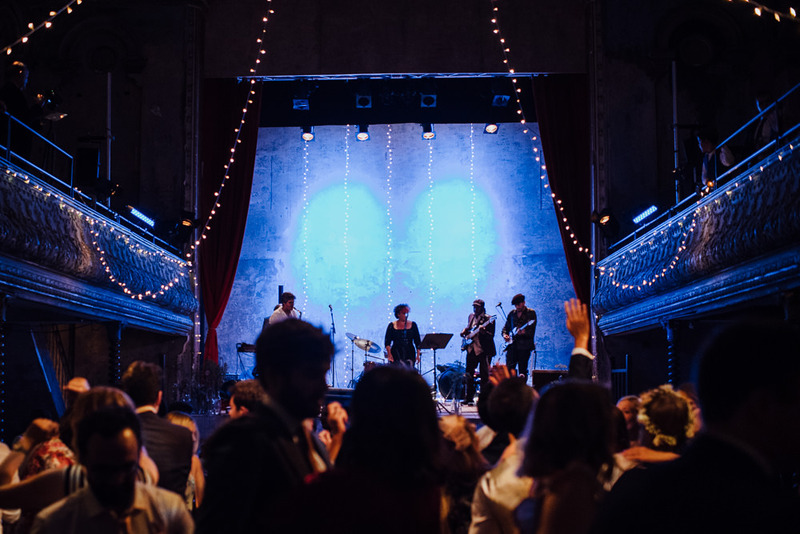 We nervously waited for Wilton’s to release their 2018 dates, and when they did there wasn’t a match. 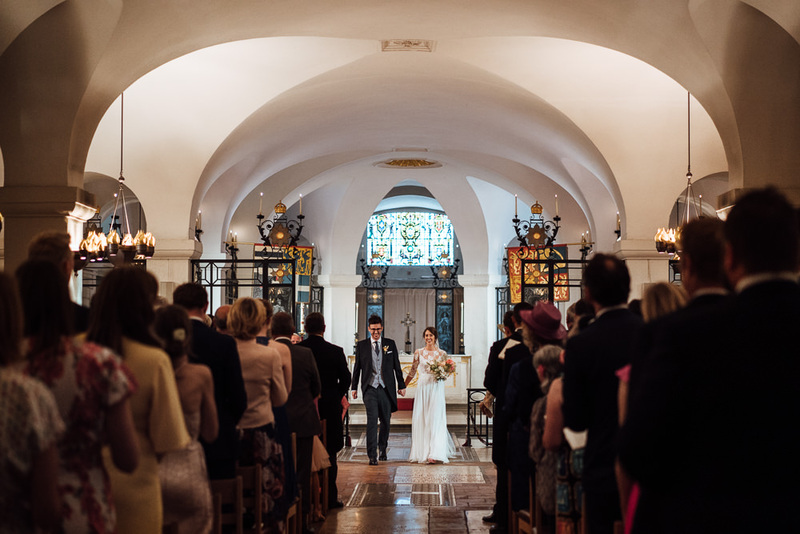 Luckily, we discussed this with the team at St Paul’s and discovered they could swap a slot earmarked for a baptism with one for a wedding, so we had a date – it was to be a summer wedding after all, and quite an early ceremony! 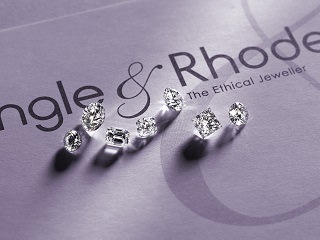 We took some time to just enjoy being engaged, which we would definitely recommend! 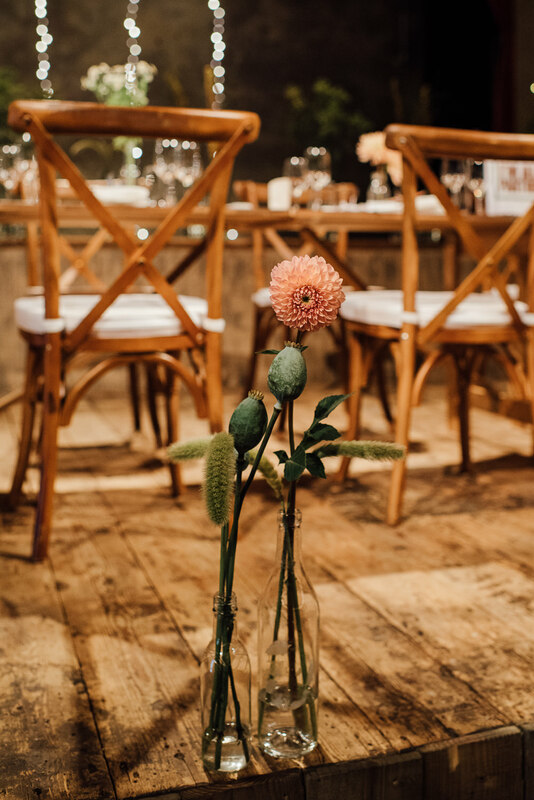 Once we had our venues and date confirmed, we then had 16 months until the wedding day so had the luxury of time with planning. 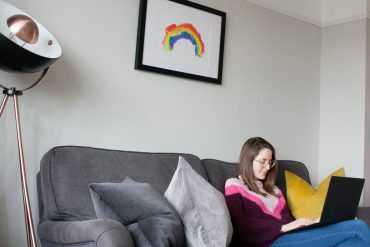 Jack is king of the spreadsheets, so we noted down all the costs, elements outstanding, and to do list and then methodically worked our way through. 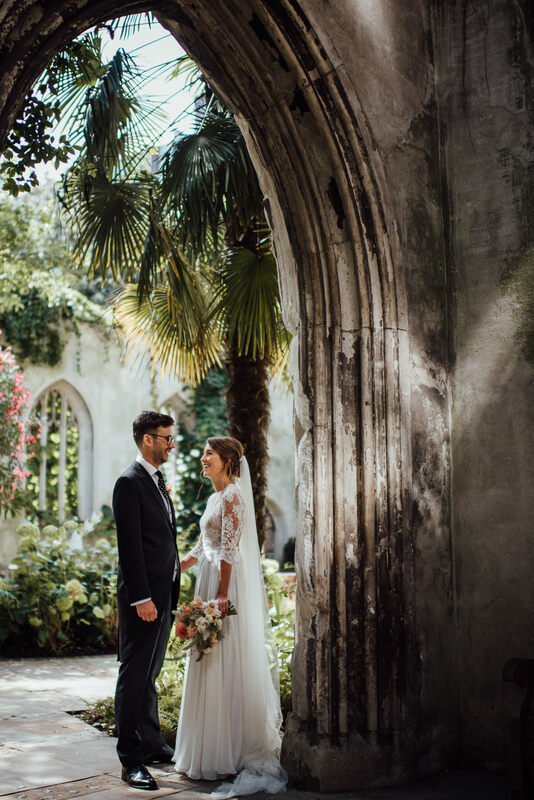 When summer 2018 rolled around, it was INCREDIBLY hot so we were starting to panic – Wilton’s doesn’t have any active air-conditioning and we’d both be wearing more clothing than you’d want to in a 30+ degree London – but in the end the weather miraculously cooled down the day before and we had the most perfect weather: sunny but 23 degrees, with a smattering of rain to cool it down in the evening! 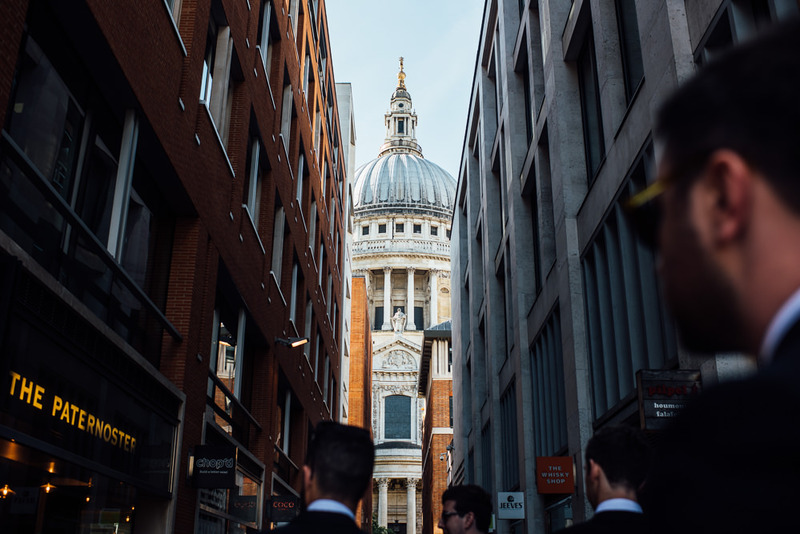 Jack: St Paul’s are quite restrictive when it comes to the readings and music during the ceremony. There is to be no contemporary music and at least one Biblical reading. 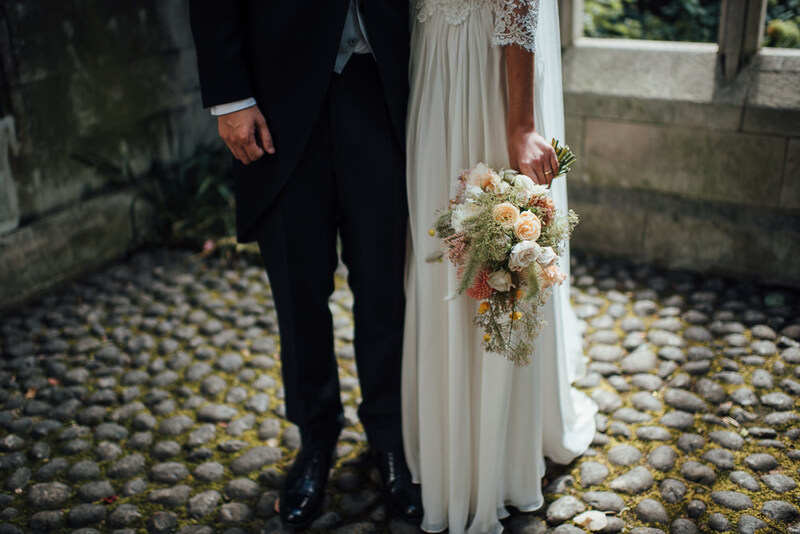 In terms of music, we compiled a three-hour Spotify playlist of the options and decided on La Rejouissance by Handel for the entrance of the bride and Lord of all Hopefulness by Struther, Dear Lord and Father of Mankind by Whittier and Jerusalem by Blake as our hymns. My father read the Song of Solomon, 2. 8-17, 8. 6-7 and Jen’s brother read ‘Blessing for a Marriage’ by James Dillet Freeman – a real tear-jerker! During the reception, we had music from the Saloon Star Band. 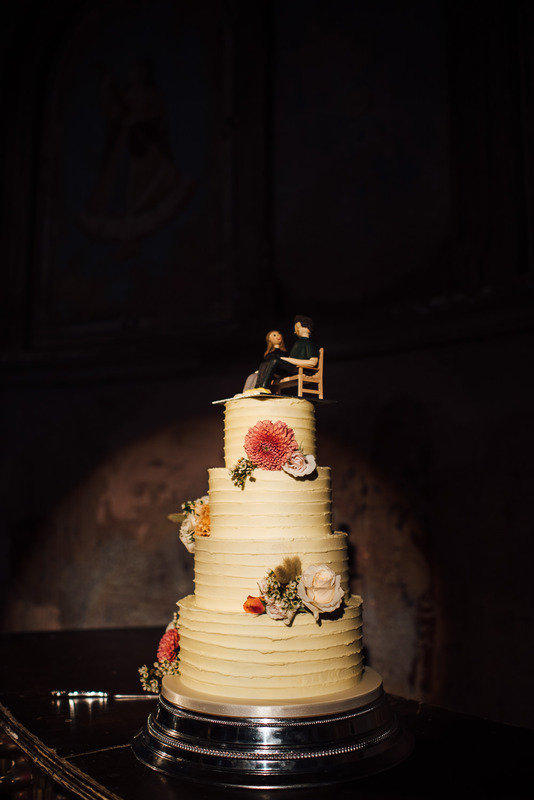 Interestingly enough, they didn’t do requests prior to the wedding and said they would ‘read the room’ and they did just that (and nailed it). 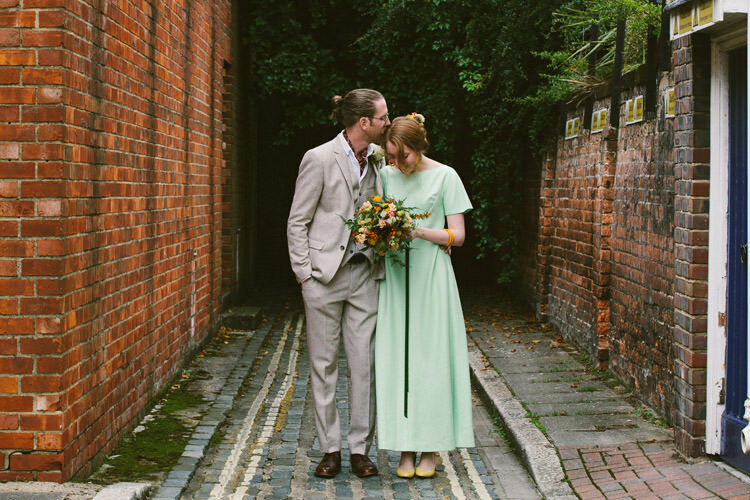 We were very aware that the numerous wedding bands we came across looked, dressed and sounded like Mumford and Sons. They all played Valerie and Uptown Funk which wasn’t really what we were after. The Saloon Star band did covers from Johnny Cash, Chuck Berry, Elvis as well as gypsy jazz and Scottish Cèilidh. 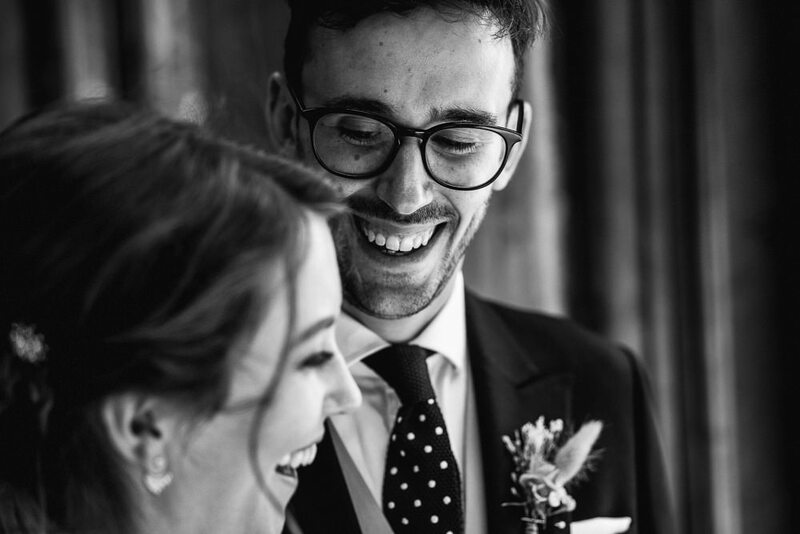 Our first dance was ‘Something Changed’ by Pulp, a song we felt fitted perfectly with our first date five years prior. 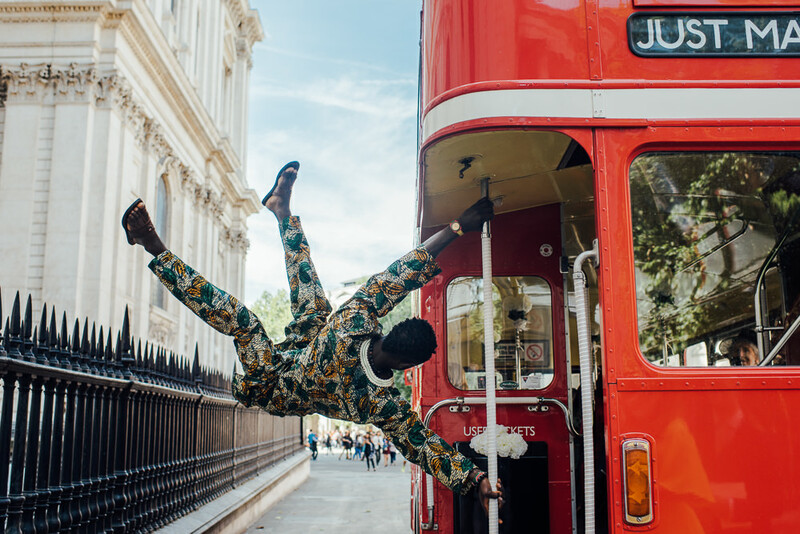 After their two-hour set, we moved onto a specially compiled, chronological Spotify playlist starting with 1950s dancehall and Motown, right up through 60s rock, 80s electro and culminating in Britpop, with a bit of Spice Girls thrown in for good measure. It worked well and meant the oldies could dance to their favourites before heading home to bed. 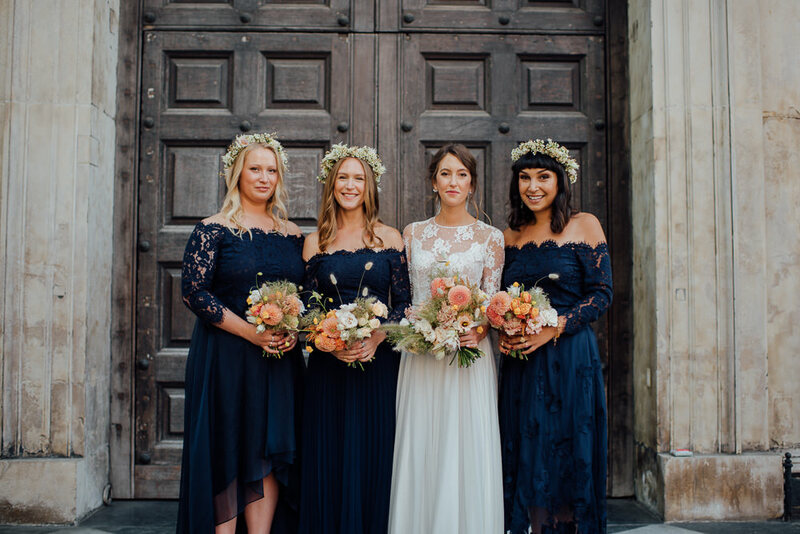 Jenine: Finding the bridesmaids outfits was honestly one of the most difficult parts of the whole planning process – I had three bridesmaids who all have very different body types and styles! 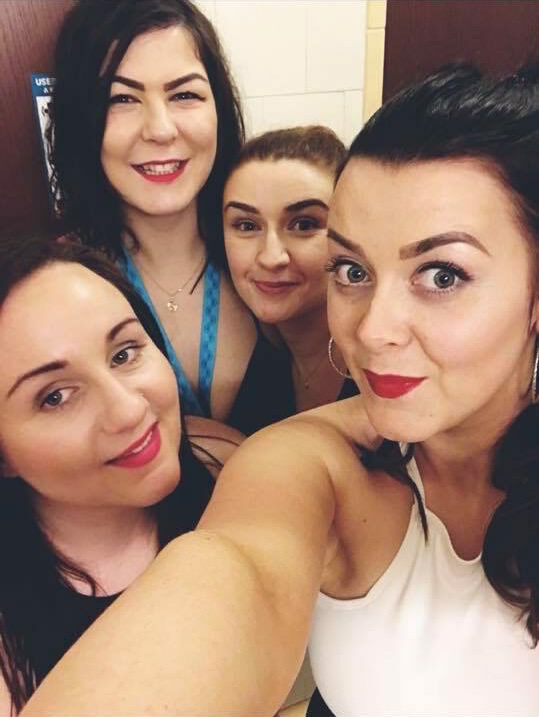 They also all live miles away (Aberdeen, Yemen and Bristol) so it was impossible to coordinate them trying dresses on together. I knew finding something that worked for them all would be difficult, so this was one of the first tasks I set about working on. 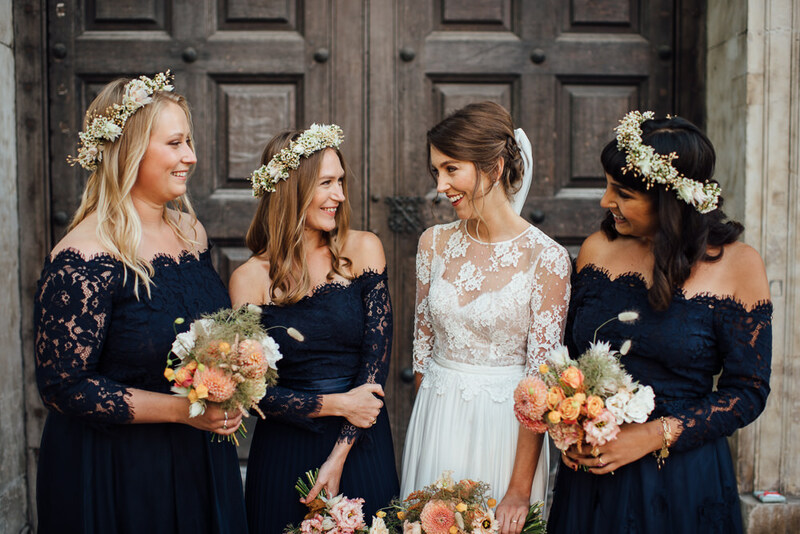 As we were having a fairly ‘formal’ wedding, I wanted them to all wear the same colour dress, to knit them together and to easily identify them as bridesmaids. 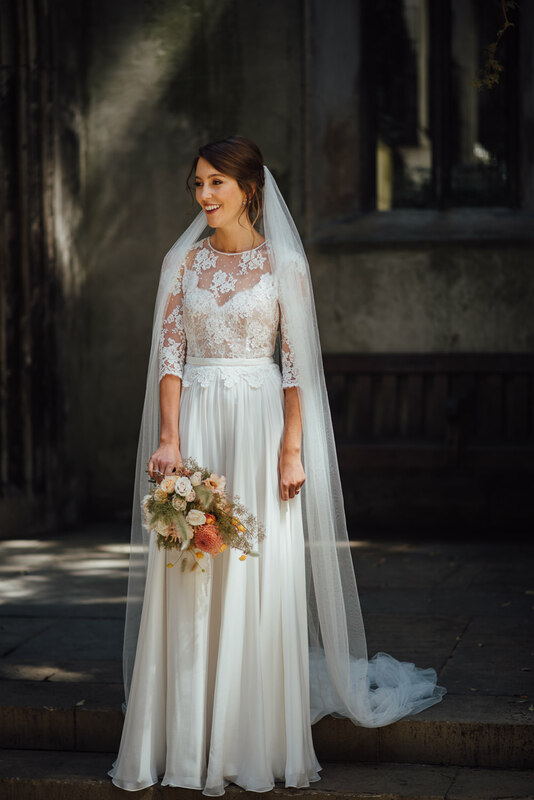 Initially, I wanted burgundy dresses but after months of searching online I realised that there just weren’t enough options for this to work. 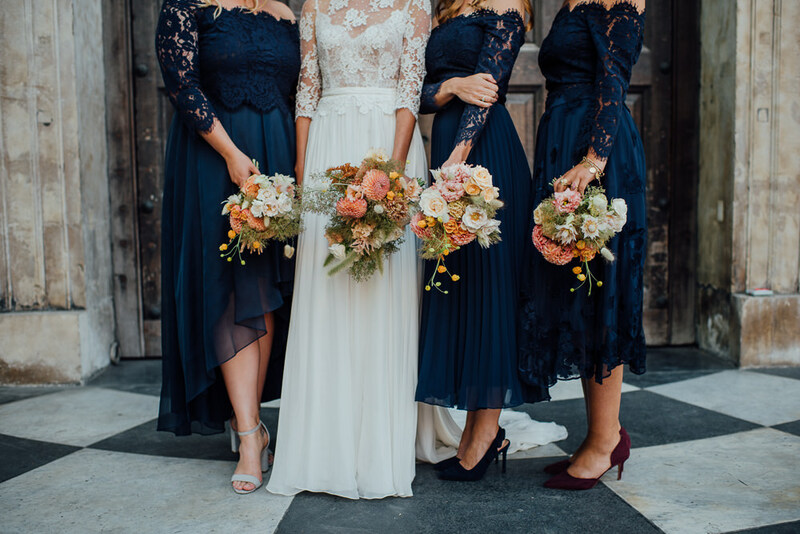 But I had seen a number of lovely navy dresses (a colour I knew would suit them all), so I selected 15 different options and emailed them over and we found a winner with Coast – each bridesmaid even decided on the same top and skirt combo!! And then the next week it came in the Asos sale at 50% off which was DELIGHTFUL to say the least! 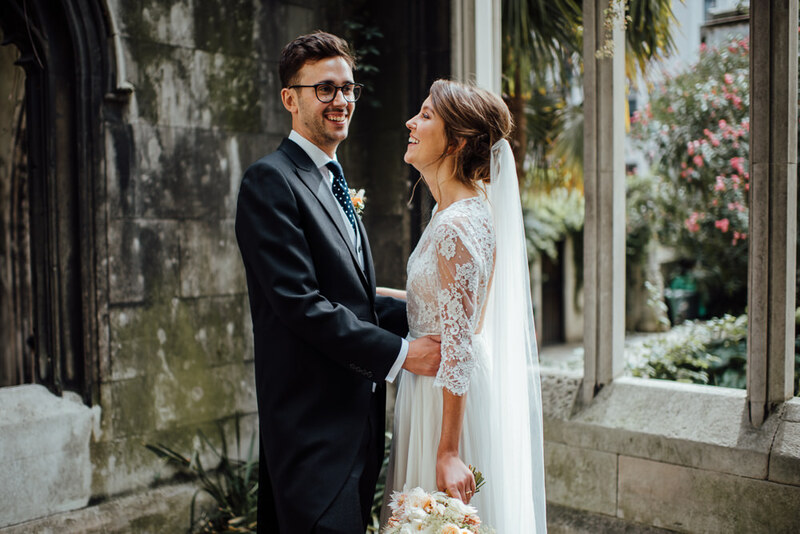 This was six months before the wedding and I was so happy to have finally ticked this off the list! 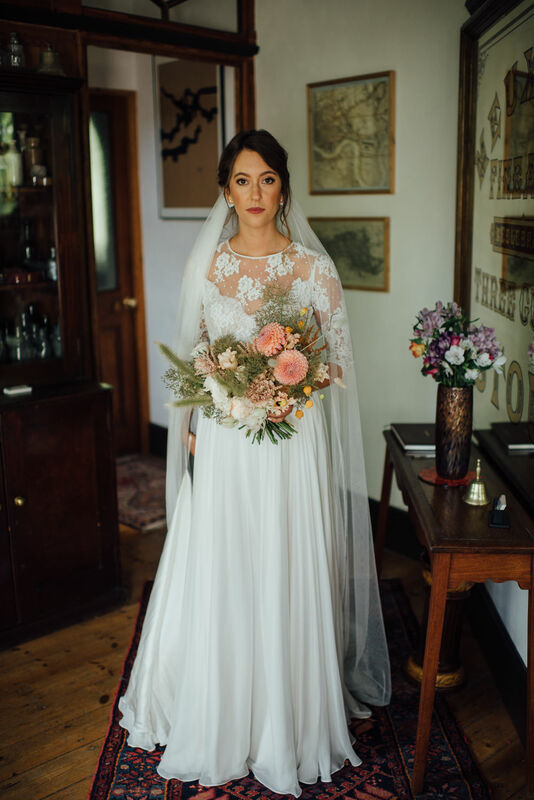 This wasn’t the end of the story though – on the day itself, none of the bridesmaids wore this original outfit due to one thing or another, BUT that’s the beauty of choosing a shop like Coast as there are so many different options in the same colourway which they could exchange at various times. 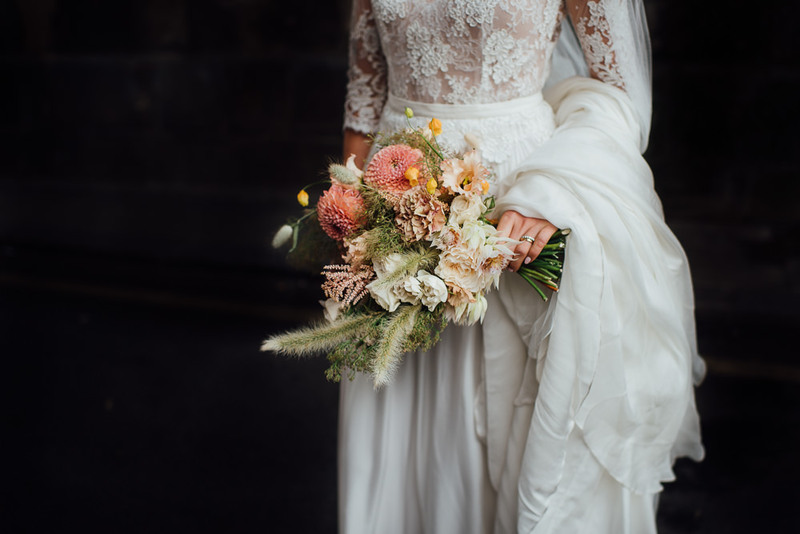 My advice to future brides would be just don’t worry about bridesmaids outfits – they’ll look beautiful regardless and there are many other things to think about! Just let them get on with it! 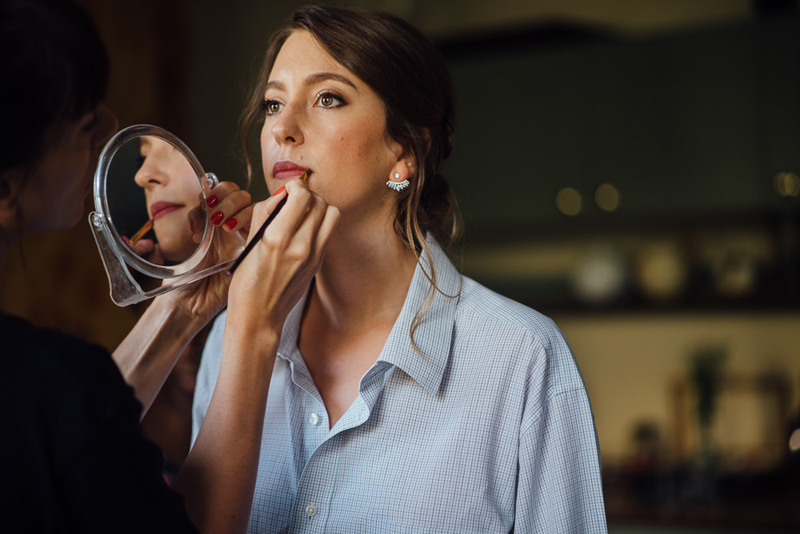 As it was such a long day (starting at 05.30), I took some extra makeup to touch up later in the evening which was one of my favourite moments in hindsight – just me, my mum and my bridesmaids changing clothes/shoes and sharing makeup and having a laugh. 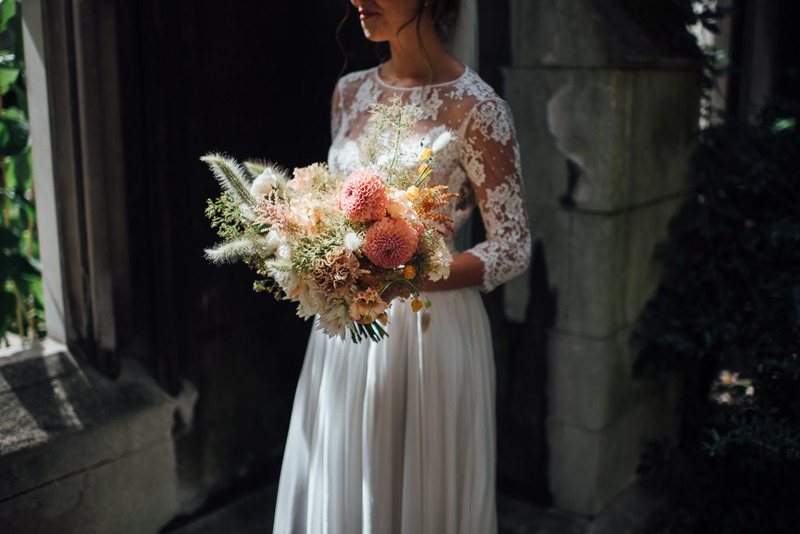 One thing I will say is: don’t believe the hype about wedding perfume – if you have a perfume you’ve worn for years, you don’t need a new one just for the day to remember, it’s just more money to spend!! 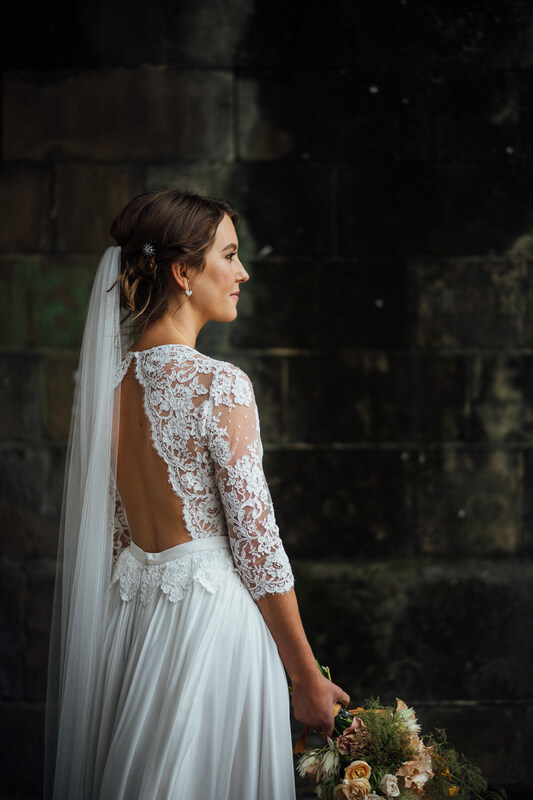 Jenine: The dress was by Margaux Tardits from The Mews in Notting Hill, and was made from such light, comfortable and luxurious fabrics that I never wanted to take it off (though I did for the latter part of the night as I didn’t want to completely ruin it!). 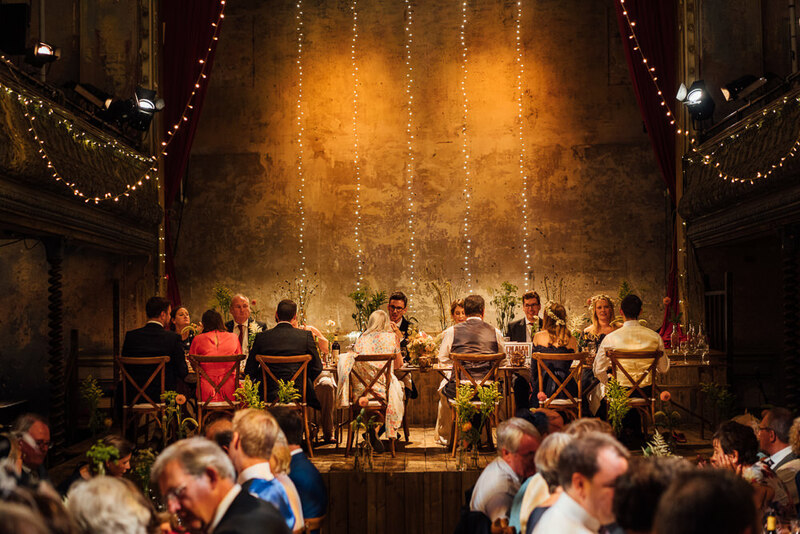 It moved beautifully and was absolutely perfect for a summer wedding. For shoes, I knew I wanted some disco heels! 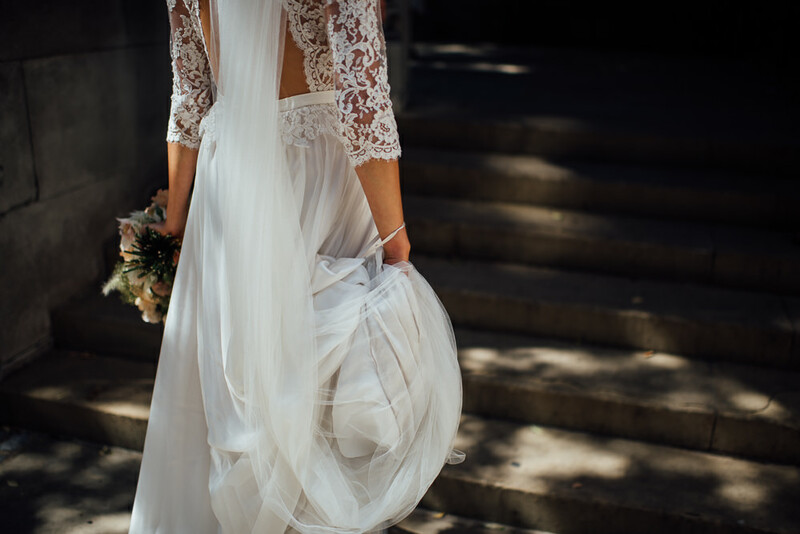 I’m not an especially girly dresser, so I knew wearing a long white dress would make me feel a bit peculiar if I didn’t have something to rough it up a bit. 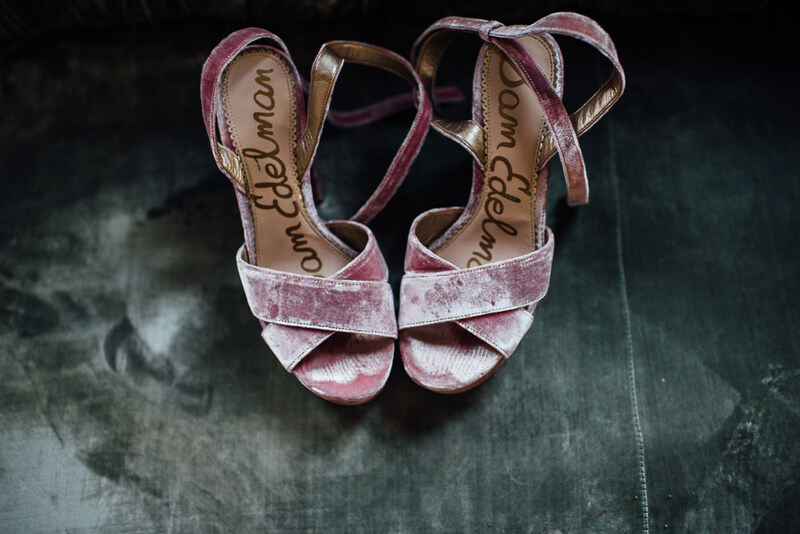 I found the very thing in Sam Edelman velvet platforms – which proved to be so comfortable that I wore them for over 12 hours straight. 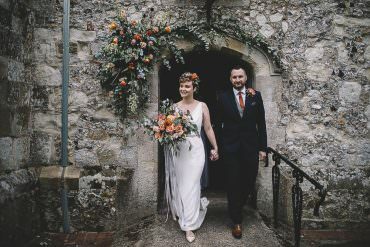 The chunky heel meant I didn’t worry about ripping my dress, and, although they were pretty substantial, I remained just shorter than my dad and my husband – though our rather short vicar had a difficult time of it. I didn’t want to wear too much jewellery as the dress was fairly detailed, but I wanted a little bit of sparkle so I bought some ear jackets from Carat London which I wore with an heirloom brooch from my husband’s family (which I wore in my hair), my mum’s aquamarine ring for my something borrowed and blue, and my engagement ring. For the evening, I changed into an old white Zara shift dress which meant I could dance around with a bit more abandon! 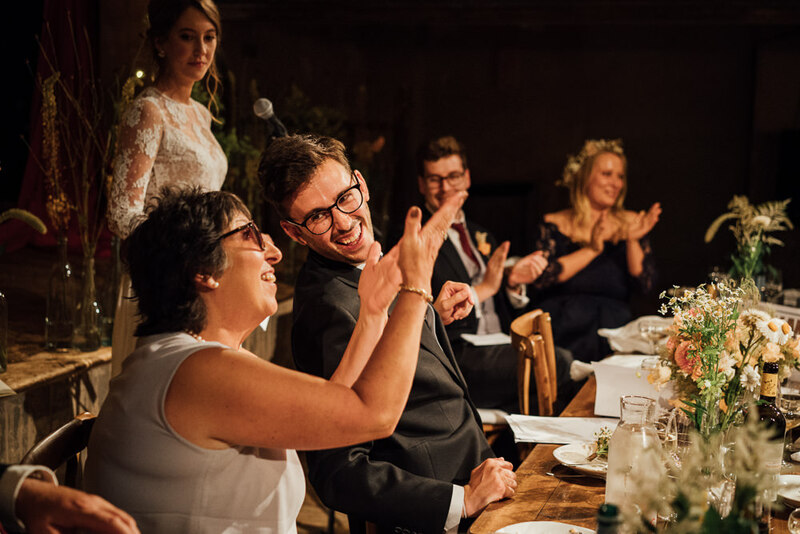 The wedding rings both came from Tom Foolery in Muswell Hill. Jack’s ring was a matt white gold band by Ruth Tomlinson whilst I went for a hammered finish on yellow gold band. 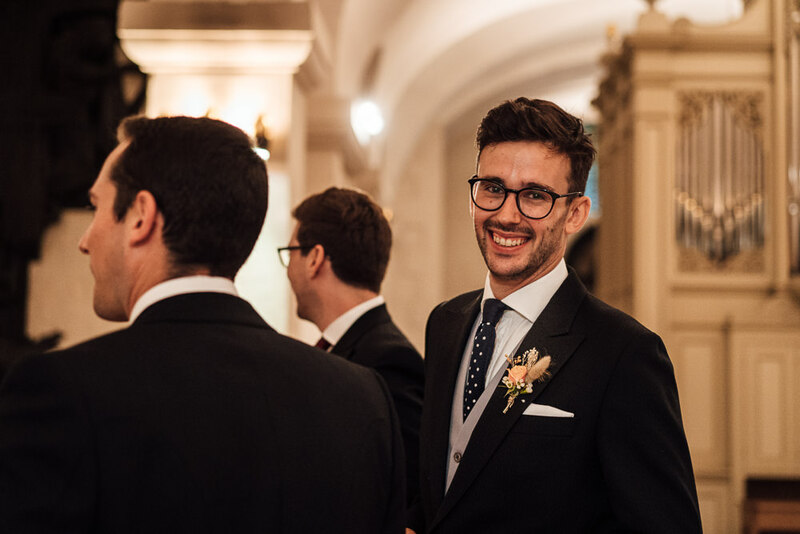 Jack: For the groomsmen, we wanted something very traditional that would suit St Paul’s but also something that would also fit our own style. 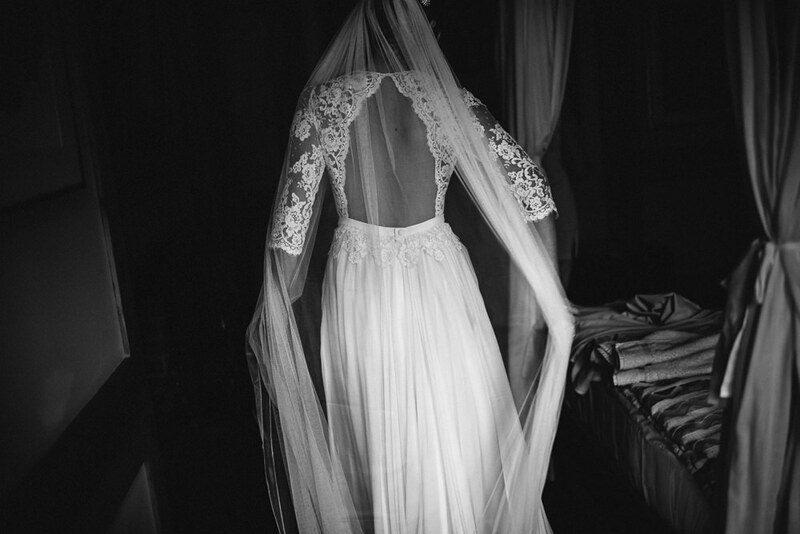 I had a total of 11 groomsmen, 13 including my father and father in law, so price was quite a big issue. I felt that tails would be best suited to the big day but there were a few subtle changes that I wanted to make to the ‘classic’ tails look. 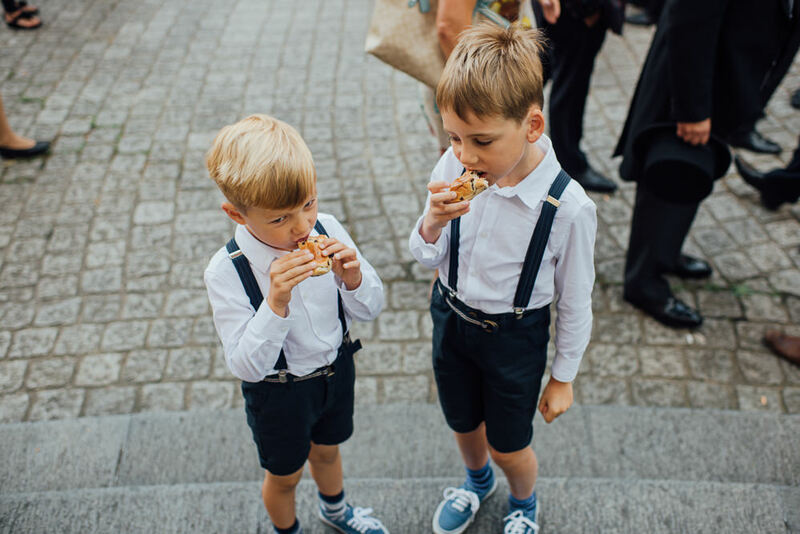 I initially took three of the boys to a shop as it seemed best value for money, but we found the material of the suits not quite up to standard and the trousers looked a little ‘flarish’ so our search continued. Eventually we found the Yardsmen, by Waterloo Station. Here we were able to include slim-fit charcoal trousers, as opposed to the traditional light grey ‘spongebag’ striped trousers, and we switched the double-breasted waistcoat to a single-breasted as they suited the slim-fit, shorter trousers. As a business they were extremely accommodating and took a lot of time with us, making sure we had exactly what we wanted. 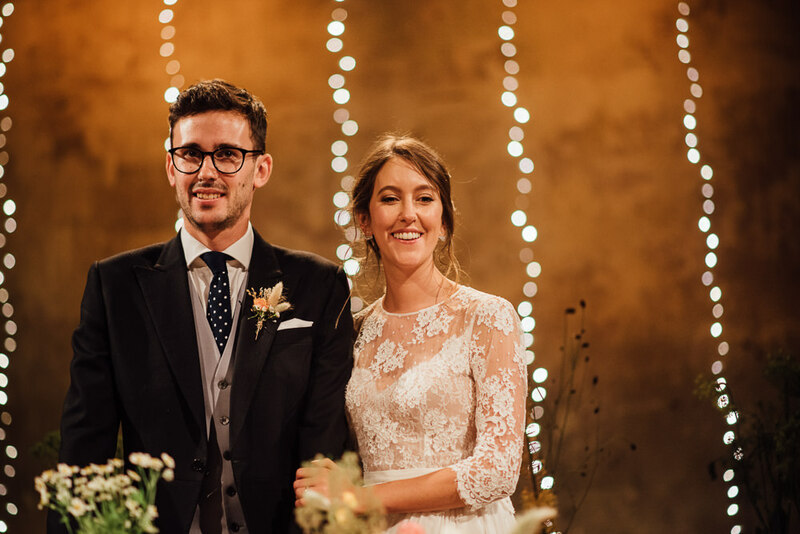 We topped the groomsmen’s outfits off with slim plain white twill shirts with a cutaway collar from TM Lewin and woven cranberry ties with a herringbone design pocket square. The shoes were plain black semi-brogue Loakes. 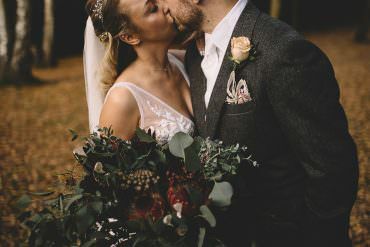 Jenine: We were thinking of asking a very talented florist friend of ours but when we found out her due date was within 4 weeks of the wedding, we thought it probably wouldn’t be the best idea for her!! 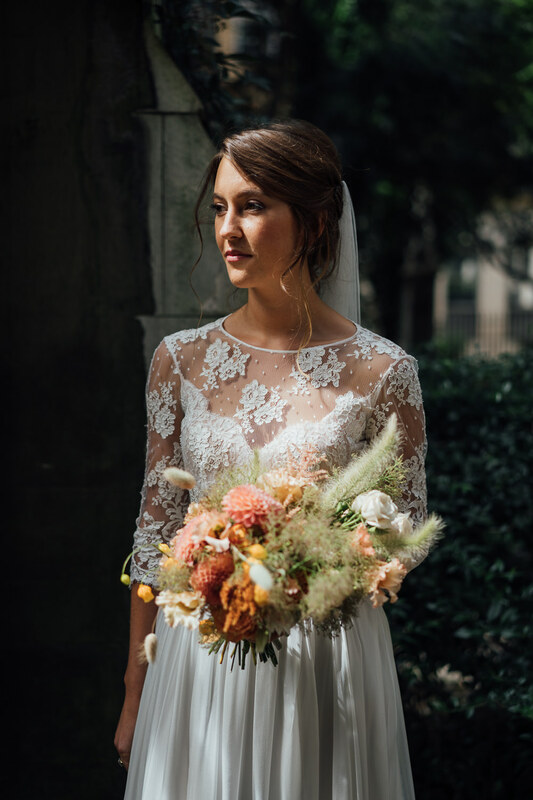 So another friend recommended one of her old school friends – Petalon – an absolutely beautiful florist company in east London. Definitely check them out on Instagram. 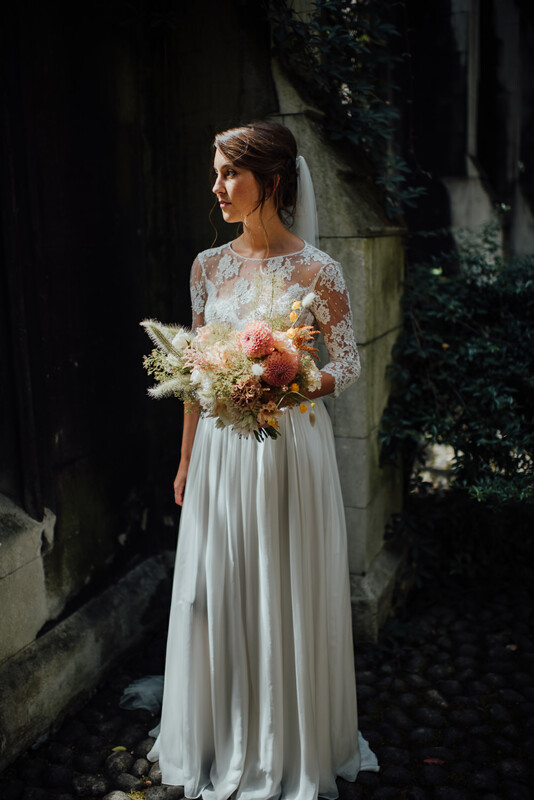 Flo instinctively put together the most beautiful ideas and we were completely sold! 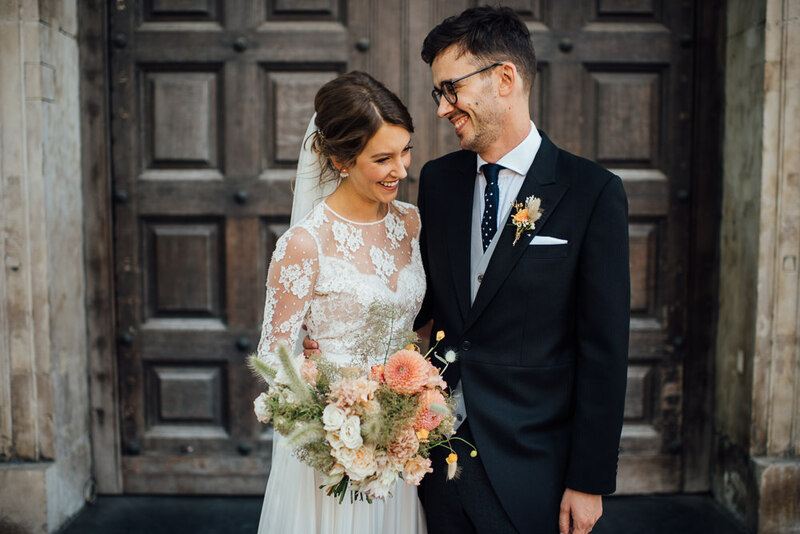 I was absolutely delighted with the bouquets, buttonholes and flower crowns – delivered by Flo on her bicycle on the morning – I just wish I could have kept them forever. For the table flowers, I asked my family and friends to collect any clear glass bottles over the year so we could use these as vases. 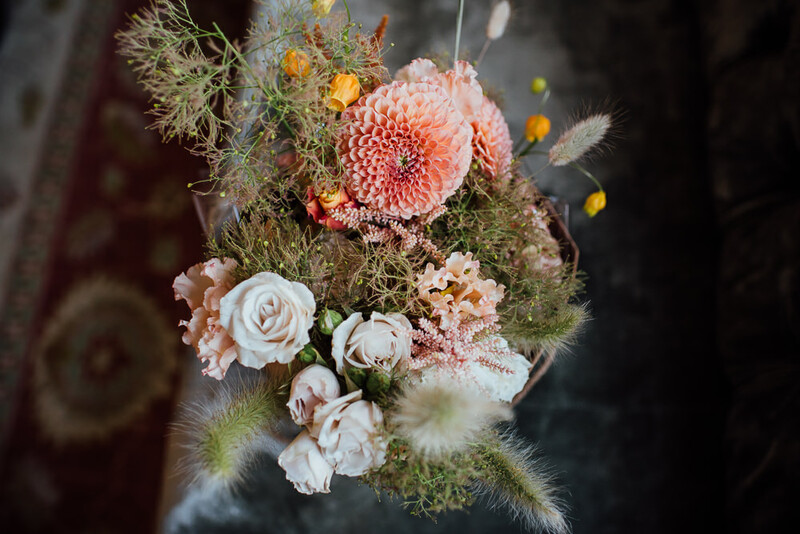 It’s incredible how many things come in bottles and is such a cheap way to do flower holders (and lovely to recall when you drank what that bottle contained etc). To fill the bottles, a few friends and I got up early a few days before the wedding to explore New Covent Garden Market which was an amazing experience! Carrying those blue IKEA bags (excellent for holding flowers) we bought a bounty of beautiful and unusual flowers, spending about £150, plus a bit extra to have a sausage bap and cup of tea in the onsite old school caff. 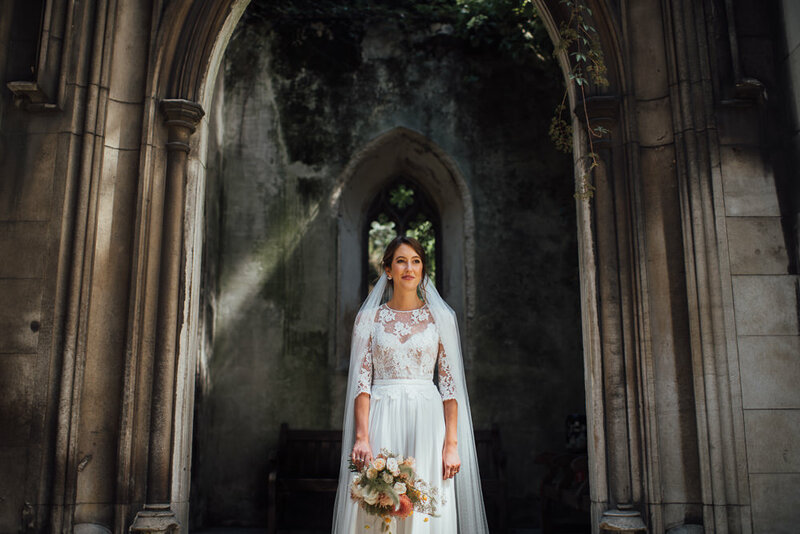 For any brides in London who aren’t worried about an early start, I would highly recommend this! 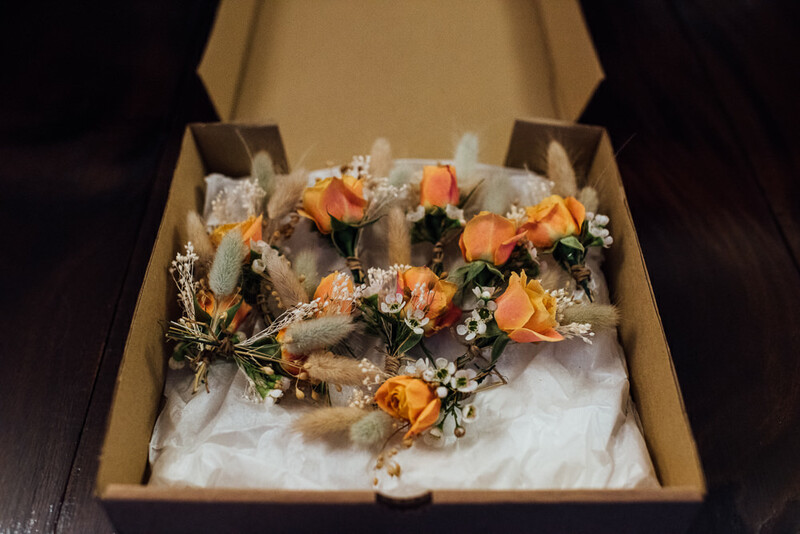 I then spent a leisurely afternoon with my bridesmaids and mum before the wedding putting the flowers into bottles which smelt amazing. Jack: What can we say about The Shannons? They were perfect. 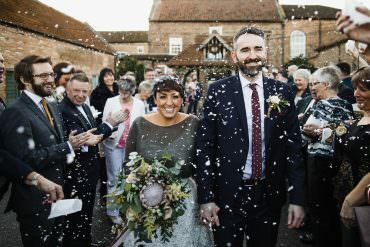 After struggling for a few months to find a photographer we liked, a colleague at work recommended Vicki and Pete and their portfolio ticked every box. 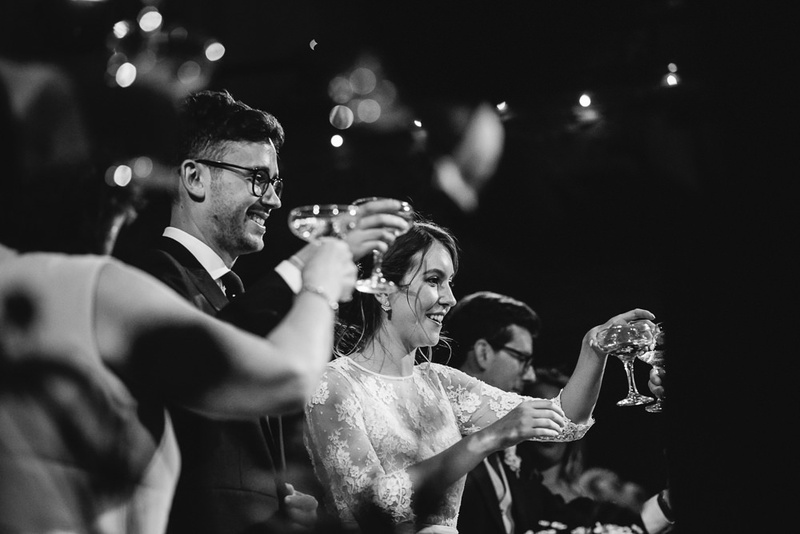 Their photography is timeless and sophisticated, their pictures never feel too forced or contrived and they captured the personalities within the wedding party perfectly. 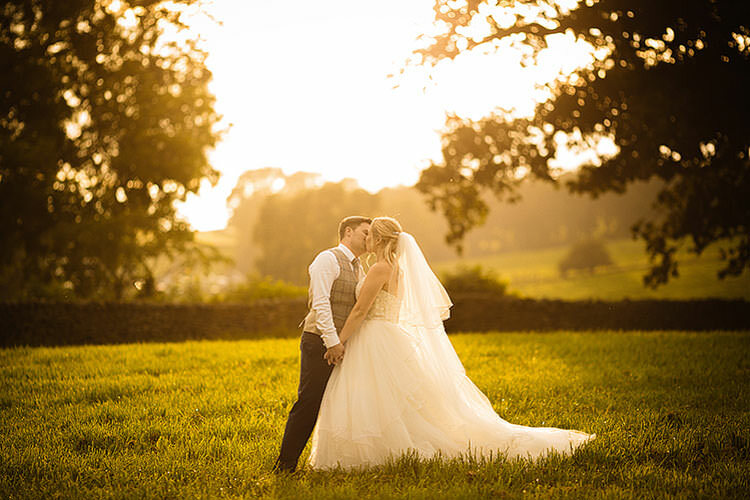 They are perfectionists, even though Vicki was 7 months pregnant with twins, they worked tirelessly to get the best shots – as a married couple, they have an ongoing competition for the best shot which is quite fun to witness! 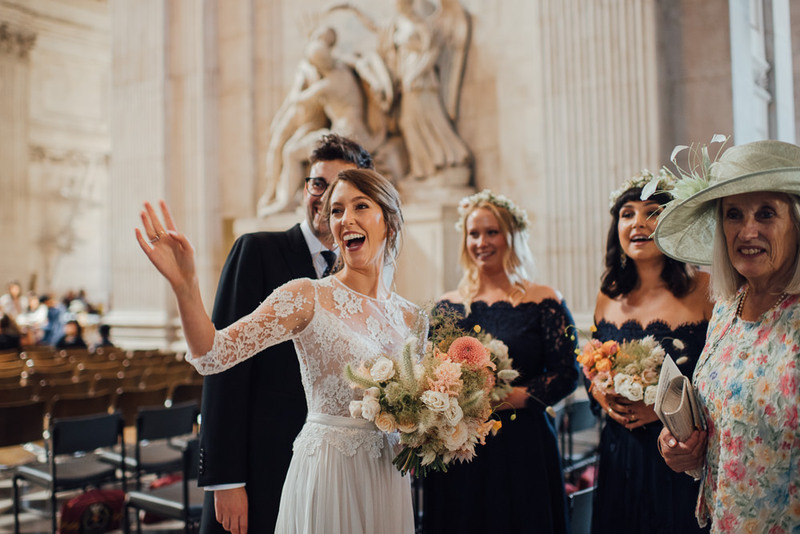 They also had the perfect attitude with the group shots, both firm and respectful which is something that I have seen other wedding photographers get badly wrong in the past. 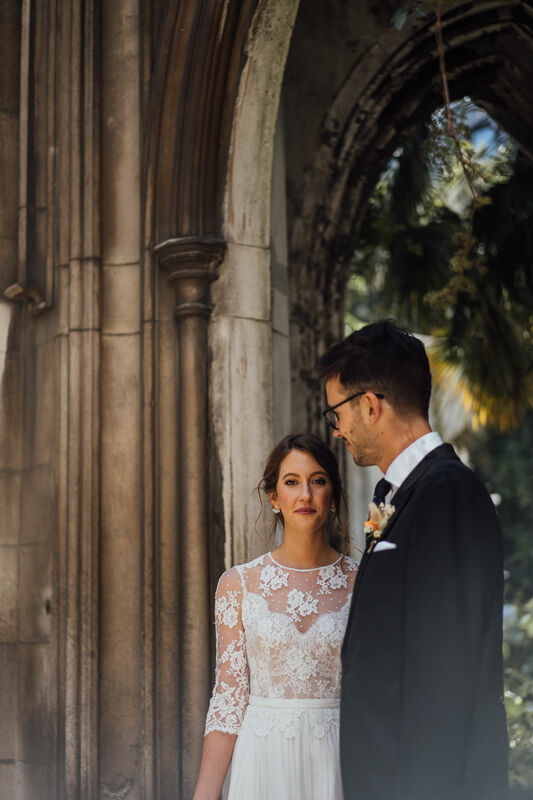 Having your wedding day documented is such a difficult call to make, but The Shannons made us completely at ease and took all of our requests on board. They were witty, calm, collected and like ninjas when we were getting ready. 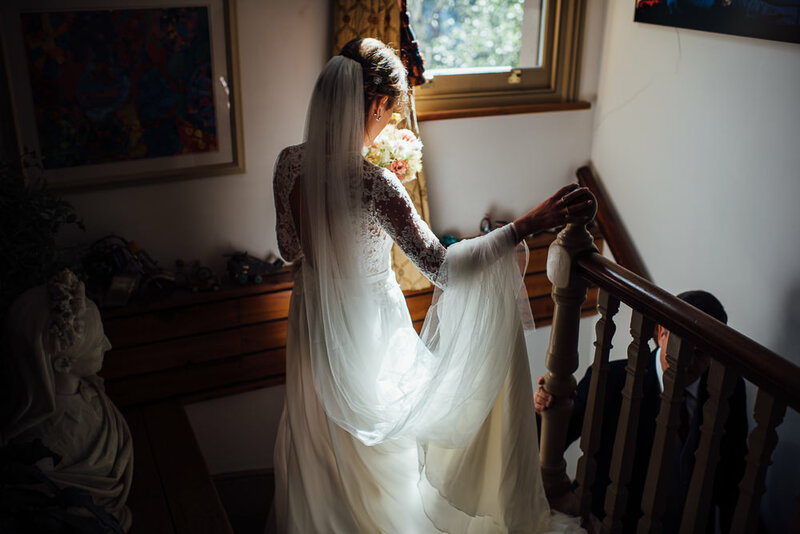 We would recommend them to anyone, and the added bonus is you get two photographers! 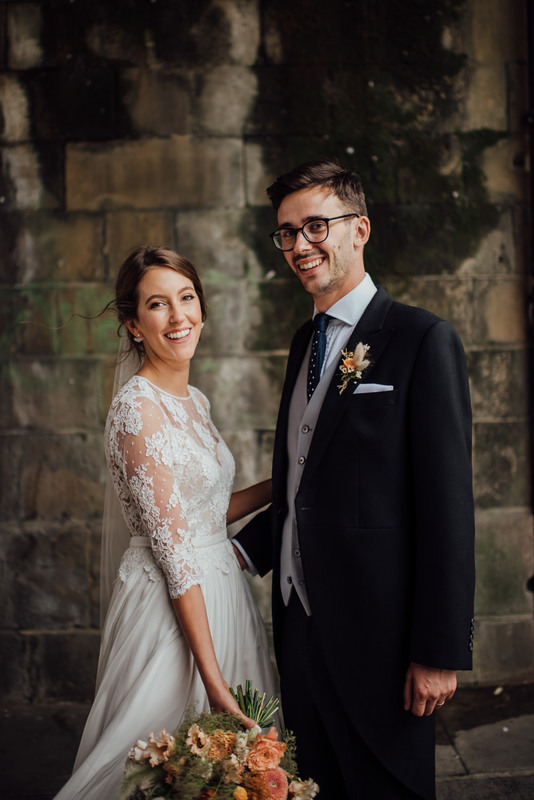 We decided not to hire a filmmaker, but we did ask a very kind uncle to record the speeches, which is really wonderful to have and something we would definitely recommend if you have a willing person – otherwise it’s very easy to forget some of the words (especially if you’re feeling bashful… or a little tipsy). Jenine: My mum makes beautiful candleholders from porcelain clay, adding texture with the impressions from shells and grasses. 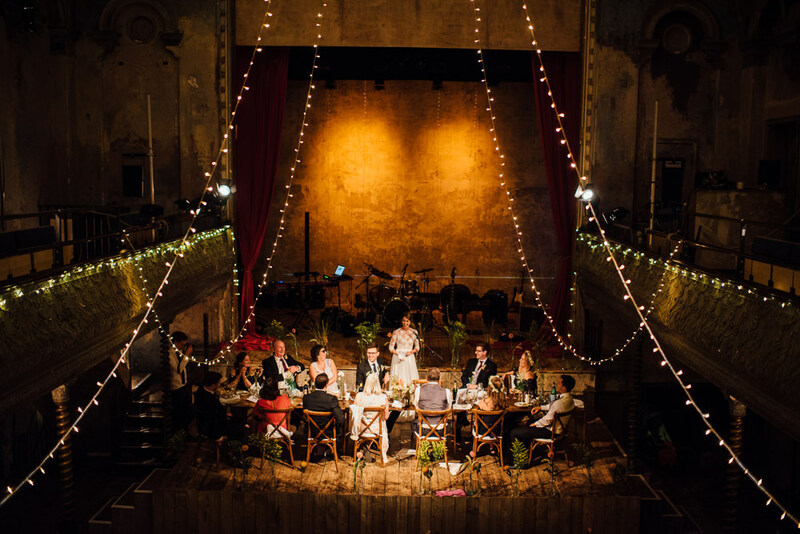 As Wilton’s Music Hall is mostly constructed of wood, they wisely don’t allow any lit flames so we used battery powered tealights, which when hidden by the candleholders flicker away very effectively. 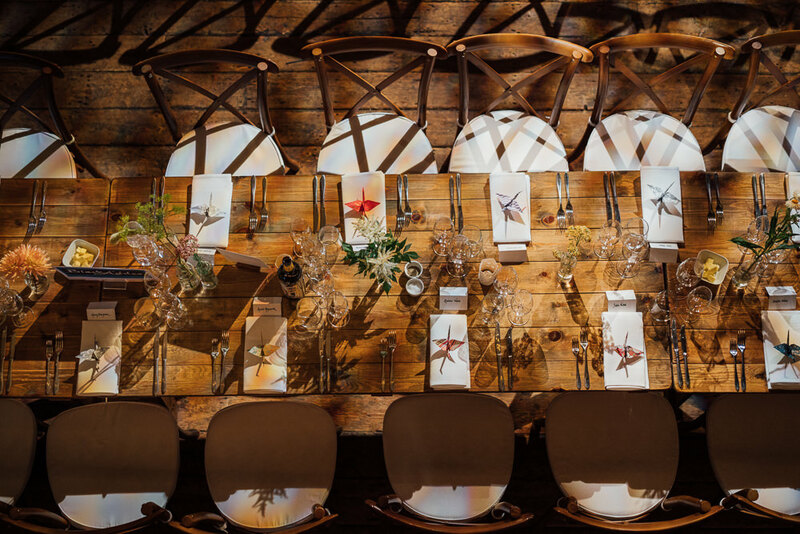 Joining these on the trestle tables were the wild flower bottles and origami cranes – again made by my mother as they symbolise happiness, good fortune and longevity. 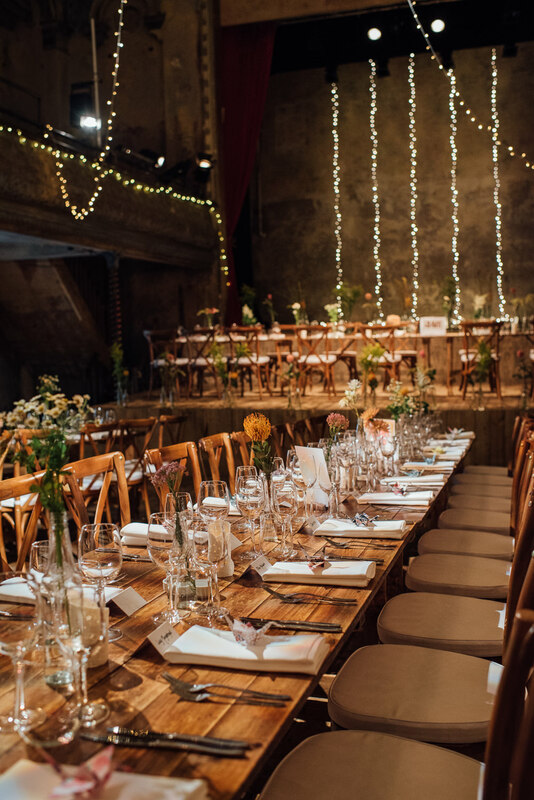 We decided to keep the main hall in Wilton’s locked until it was time to eat, to make sure there was still a surprise for everyone. 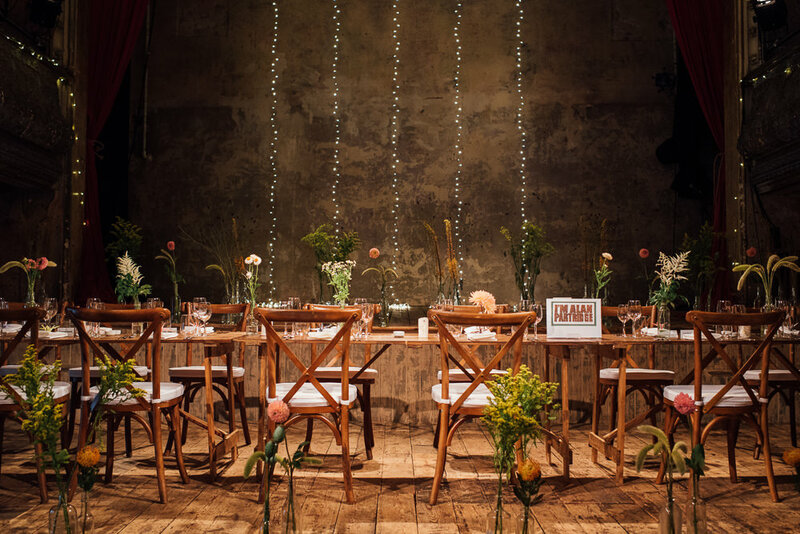 We very much wanted to be able to create our own menu, rather than have a package deal, and The Gatherers were absolutely perfect. 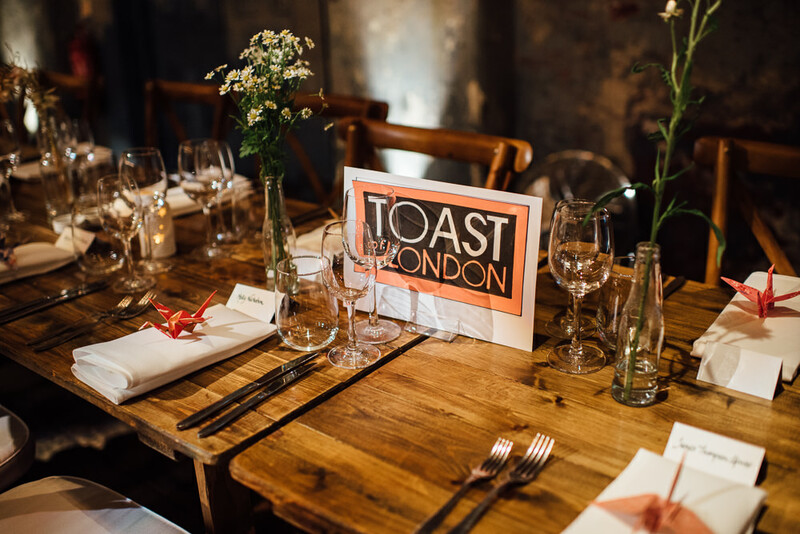 They created an astounding menu, full of colour and texture and the most incredible canapés! Later on, The Gatherers also served some pizzas and we brought in some cheeses and a tiered pork pie cake for when people got a bit peckish. 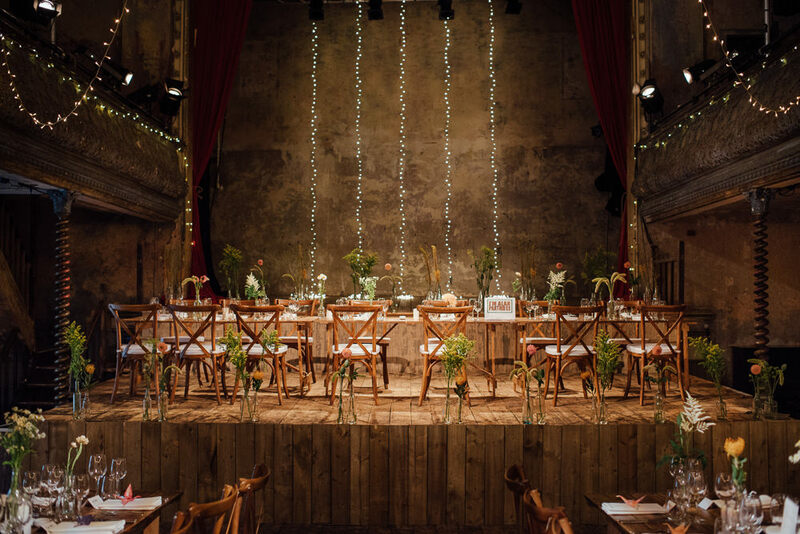 We hired in tables, chairs, plates, cutlery and glassware, including the most perfect champagne glasses from Classic Crockery, and the team at The Gatherers and Wilton’s also organised the set up of Wiltons for us on the day, which made everything so much easier. Jenine: It’s really true when people say that things will go wrong but that it doesn’t matter one bit! There were many small issues that just made the day even more memorable – Jack’s mum and most of the family arriving just in the nick of time for the ceremony, the second bus to take people from the church to the wedding getting held up in traffic for over an hour, meaning that those on the first bus were VERY merry with champagne by the time it arrived, and those on the second bus had a bit of catching up to do! 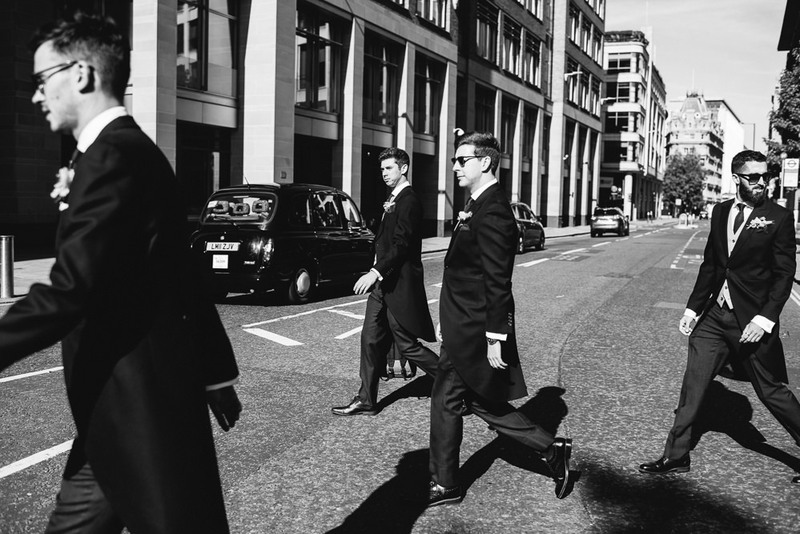 Make sure you have at least one or two well-organised groomsmen/bridesmaids to help with any issues that may arise on the day and they should take care of the rest. 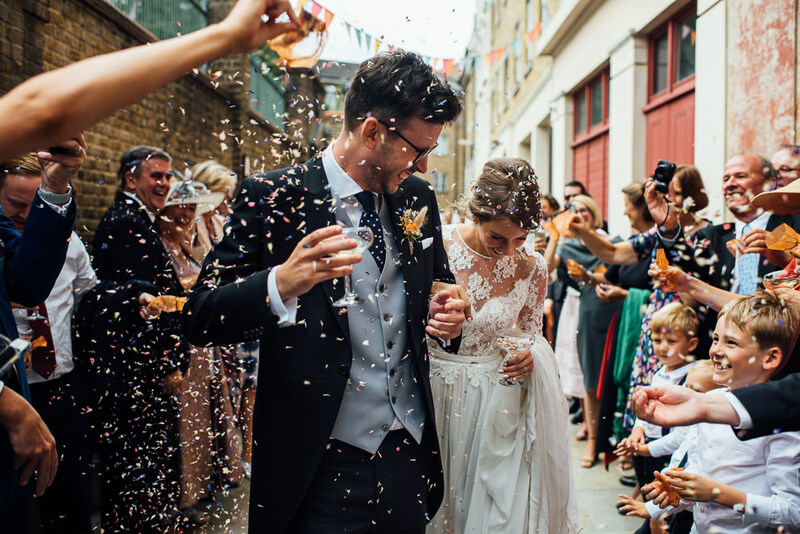 Just enjoy it – hopefully you’ll only have one wedding so you have to make the most of it! !